Dinner doesn’t always need to be super fancy and sometimes you just can’t beat a big ol’ bowl of chicken wings. At the same time it would be rude not to do those wings justice. So with this homemade pineapple, chili & ginger glaze you will certainly be doing your wings proud. Oh and no doubt your dining companion will be smiling too! 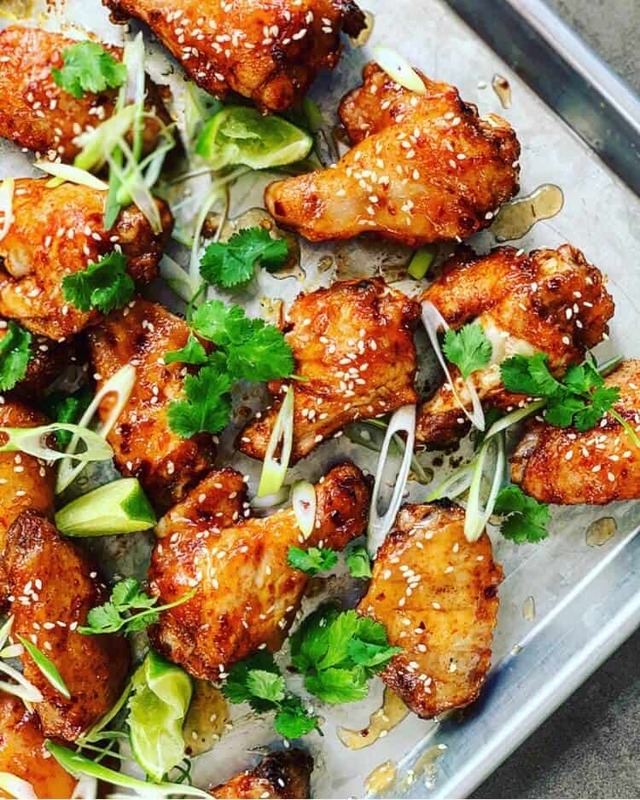 Now, who wants some Pineapple Glazed Wings…. There is a lot I didn’t eat a ton of living/growing up in Ireland and wings were one of them. Well, that’s a lie. I did eat plenty wings but the quality of them was fairly mediocre so I choose to forget about the overcooked and dry wings thrown into a deep fryer! Bbqing growing up typically consisted of dumping an ENORMOUS amount of coals on a bbq and as soon as they were lit then throwing a steak, burger or piece of chicken on and watching the outside very quickly cremate while the inside hits a not so perfect RARE AF temp………. Plus there wasn’t too many days that allowed bbqing to be done. Invariably those days I was working too and the next day – rain. Luckily for me here in Brisbane its BBQ season all year round! Now that I have discovered weber grills (and I am sure many others have too) it allows for bbqing to be done in pretty much all conditions. So with that being said things like pulled pork, short ribs, slow cooked lamb and chicken wings have become staples in AnotherFoodBlogger’s home. You really can’t beat the smell that comes from a good bbq nor the taste. It’s totally worth every penny we spent – for the record we now own 3 webers. If my wife allowed I’d happily get more……. Mix all ingredients except lime, cornflour & water together in saucepan and put on medium heat. Cook sauce for approx 5 - 8 mins until combined and sauce has thickened a little. Mix cornflour and water together and stir into pineapple sauce - this will thicken the sauce. Toss the wings in oil. Mix all rub ingredients together and rub into chicken. Leave rub for minimum 30 mins but up to 24 hrs if you are well organised. Place wings on bbq on indirect heat @ 150c for 35 mins - basting every 10 - 12 mins. Turn heat up to 220c for 3 - 5 mins to crisp up the wings. Another amazing recipe and yum!!! I love ginger, I love chicken wings. This is perfect. My mouth is watering. These look so good! Those photo made my mouth water! I love pineapple in savoury dish so that sounds so perfect! These look amazing! Would fresh pineapple work ok in place of tinned? We just harvested a beautiful one we have been growing for almost a year, this might just be the perfect use for it! I don’t see why not – u may need to add more sugar as the syrup in the tinned ones increases the sugar content but all u gotta do is taste and see. Just make sure u blitz the pineapple up til it’s smooth. Would love to see some pics of your dish!!! I envy your work, regards for all the informative posts. I just say yum….Thanks for sharing….